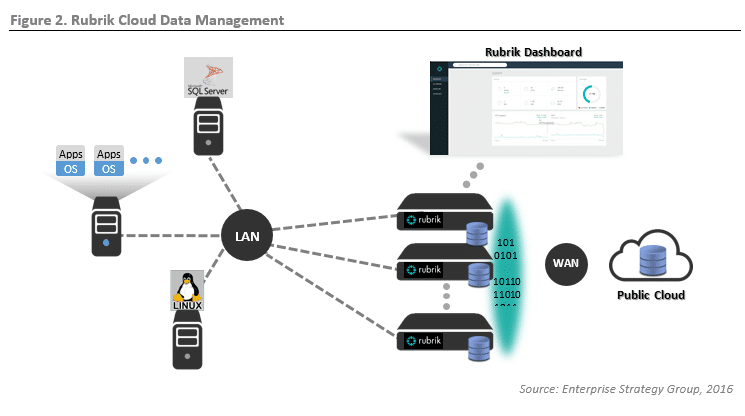 ESG Lab recently completed testing of the Rubrik Cloud Data Management Platform, which delivers backup and recovery, offsite replication, and data archival in a simple, scale-out appliance built for hybrid cloud. Testing focused on the simplicity of the Rubrik solution for managing and protecting virtualized and physical environments. ESG Lab examined how Rubrik users can get started quickly and easily, set up policies to automate backups, perform restores in a variety of ways, drive down recovery time objectives (RTOs) with live data access, and locate backed-up systems and data instantly with Google-like search.